New Delhi, March 6: A belligerent VK Singh told a news agency that the next time India conducts an air strike, Doubting Thomases in the opposition should be tied to the IAF jets and dropped at the location of the strike so that they can count the casualties. "Agli baar jab Bharat kuch kare toh mujhe lagta hai ki vipakshi jo ye prashna uthate hain, unko hawai jahaz ke neeche baandh ke le jayein, jab bomb chale toh vahan se dekh lein target, uske baad unko vahin par utar dein, uske baad vo gin le aur wapas aajayein," he said. The Union Minister's comment comes after the opposition raised questions on the opacity on the number of casualties in the Balakot air strike. The government has offered no numbers on the deaths, except for the MEA statement on a 'large number of casualties' in the air strike on the Jais-e-Mohammed terror camp in Pakistan. BJP president Amit Shah's figure of 250 deaths remains unsubstantiated. 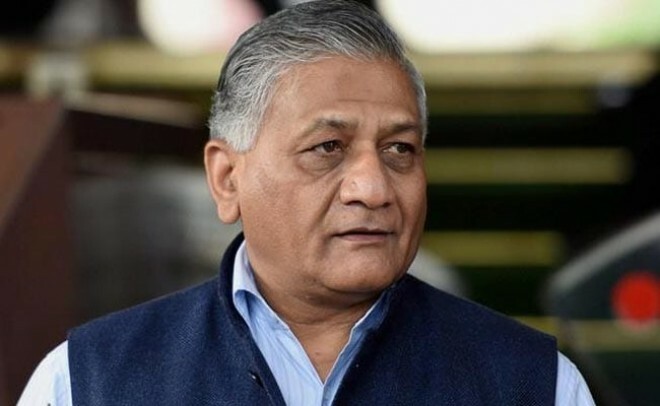 VK Singh also hit out at senior Congress leader Digvijaya Singh for terming the ghastly Pulwama terror attack an "accident" and asked him whether the assassination of former Prime Minister Rajiv Gandhi was a terror incident or just an "accident". "With due respect, I would like to ask Digvijaya Singh Ji, was Rajiv Gandhi's assassination an accident or a terror incident? Let him answer this first," VK Singh, who is Minister of State for External Affairs, had said.